Spicy Skittles and Starburst: Hot Seller or Fast Markdown? The company behind Skittles and Starburst has teased a new treat coming out next year: Spicy versions of the two candies. Called 'Sweet Heat' Skittles and 'Sweet Heat' Starburst, the candies will be 'fruity flavors with a spicy kick'. But while other spicy snacks like chips and pretzels are major hits, many social media users seem less convinced by these hot items. Wrigley, the company behind both popular chewy fruit candies, hasn't officially announced the upcoming items, which are scheduled to hit shelves in January 2018. Last week, however, they debuted them at the Sweets and Snacks Expo in Chicago, with a stand where attendees could try them out. They found that flavors of the Skittles will include Fiery Watermelon, Mango, Flamin’ Orange, Sizzlin’ Strawberry, and Lemon Spark, while Starburst flavors will be Fiery Watermelon, Strawberry Mango, Flamin’ Orange, and Pipin’ Pineapple. Another Twitter user who claims to have tested them compared them to Mexican candy, and noted that they're 'really not that bad'. Social media users, though, aren't convinced. While a few outliers seem very excited about the upcoming candy and have promised to buy them, the majority are expressing confusion over who, exactly, thought this was a good idea. Another man joked that Spicy Skittles and Starburst were an indication that the apocalypse is coming, and quite a few others simply wrote variations of the word 'ew'. Well you’re in luck, because Topshop is now selling jeans with clear plastic kneecap covers sewn in. We’re not quite sure who the intended audience is for these poorly-named “Clear Panel Mom Jeans” from Topshop. But for only $95, these jeans can be yours. Though the internet only recently discovered this interesting piece of plastic disguised as clothing, people who have bought the Topshop jeans on Nordstrom only had rave reviews about the pants (though the comments look like they were probably left by trolls). “I’ve always loved my kneecaps. So when I saw this pair of see-through kneecapped jeans, I had to get my hands on them! YOLO,” one reviewer wrote, though it’s unclear if they’re trolling us all or not. 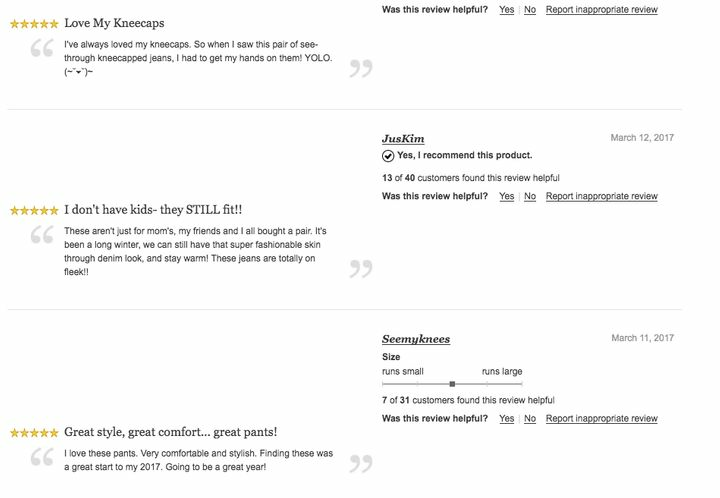 Another reviewer made it clear that these jeans “aren’t just for mom’s [sic],” thank goodness! L’Oreal’s smart brush ‘listens’ to hair, recommends luxury treatments: your hairbrush is judging you! Beauty giant L'Oreal has launched a "smart" internet-connected hairbrush that analyzes users' hair type and recommends products accordingly. The French cosmetics group claims the device – known as the Kérastase Hair Coach Powered by Withings - is "the world's first-ever smart hairbrush." It was launched at the Consumer Electronics Show in Las Vegas this week and will be available in salons and online for under $200 from mid-2017. Technology company Withings makes health products including activity and sleep trackers, air quality monitors and wireless blood pressure monitors. It was bought by Nokia in May 2016 for $191 million. "Technology is transforming consumers' daily beauty routines, and smart devices have huge potential to impact how we care for our hair and skin," said Guive Balooch, global vice president of L'Oréal's Research and Innovation Technology Incubator. "By using connected technologies to upgrade the hairbrush — something the average consumer uses every day — Withings and Kérastase have reinvented what a person's relationship with their hair can look like and are showing how connected devices can revolutionize the beauty industry." The connected brush is part of the "Internet of Things" trend, where products are able to communicate with each other, with companies and with consumers via their smartphones. IoT products and services attracted nearly$7.5 billion in investment between 2010 and 2015 according to analysis by CB Insights. The Moschino Barbie & Ken Giftset includes Barbie and Ken dolls wearing miniature versions of the evening outfits that Moschino creative director Jeremy Scott and Irish supermodel Stella Maxwell sported on the red carpet of the 2015 MTV Video Music Awards last August in Los Angeles. Barbie is dressed in a black velvet strapless gown showing an oversized ruffle with graffiti-inspired decorations, which wraps around the body. Ken wears a multicolor striped tuxedo. The gift set, which retails at 239 euros, or $254 at current exchange rate, is on sale through Moschino’s online store, plus at the brand’s boutiques in Milan, Rome, London, Paris, New York and Los Angeles. There are also two beach towels printed with the image of the dolls, which are each priced at 86 euros, or $92. People are spending serious green on collard greens. Just two days after the internet had a collective conniption fit about Neiman Marcus selling pre-cooked and frozen collard greens for $66 plus $15.50 for shipping, the luxury department store has sold out of the insanely marked up side dish. “[They] better taste like unicorn tears and Prince’s bath water,” The Root, a black-focused website, so eloquently wrote on Twitter in response. Yet, it wasn’t just the price point with which people took issue. Many felt that Neiman Marcus’ move was an appropriation of food culture.